Add $3 for a platter with fries. Georges doesn’t take reservations, but when 10 of us showed up for lunch, they were very quick to put tables together and sit us in the sunny front part of the restaurant. To say the service was great is an understatement – the staff was very friendly, fast and attentive the whole time we were there. The food came quickly, and we were all served together. Portions were large and the price quite reasonable. The only complaint was the tables were different heights so two people had to be very careful where they put their drinks. 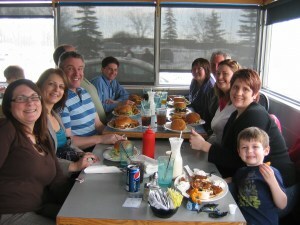 I have to apologize for the photos – every one’s out of focus – I guess I was just so excited about having a burger. I’ll do better next time. I had the bacon double cheese burger and *loved* it. I admit I’ve been looking forward to the Burger Club kick-off at Georges, and was positively salivating for a burger so that may have contributed to my enjoyment, but it really was a good burger. The burger patties were hand squished and a good size. They’d been cooked on a hot grill so were seared nicely on the outside but still juicy on the inside. The bacon was real bacon and not over done. I liked the balance of toppings and enjoyed the chili sauce. 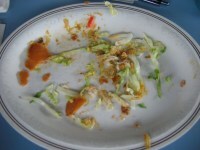 Perhaps because it was already a big burger, they didn’t over do it with the shredded lettuce. 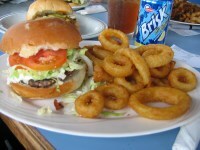 If it was lacking for anything, the thin slice of processed cheese was pretty much lost in the burger. The bun was warm, had a crust, but wasn’t hard, was big enough to do the job, but most importantly, it held together to the last bite! It was a bit sloppy (as a good burger is supposed to be), but I didn’t need a shower afterwards. Most of the crew had the Fat Boy. The burgers were piled high with shredded lettuce (too much for some), and as with the bacon burger, you had to look for the cheese slice. Perhaps because the burgers are handmade, there was some variation in size. Some thought it a little too salty and a bit over cooked. There was some discussion over whether the bun had been fried. I didn’t think so, but it was definitely served warm so maybe it did spend some time on the grill. Overall a good burger! The fries are good and there were lots of them. The shakes are heavenly. 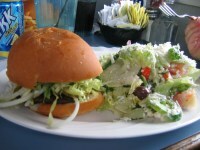 One diner substituted a Greek salad for fries and said it was awesome with lots of Feta and crisp, fresh lettuce. 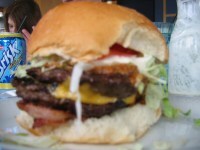 Week 2 of Burger Club will be at Daly Burgers. Stayed tuned for the next report! Georges was a great place for our first Burger Club meeting of the year. The atmosphere in Georges is like a little Greek mom and pop restaurant, neat, clean and reasonably comfortable. With ten of us at a table together we were a loud bunch until the burgers came out that is. For lunch I had the fat boy with the side salad. I was dismayed to see that all the burgers except for maybe two listed chili as a condiment, but was pleased to be able to list exactly what I wanted on the burger. 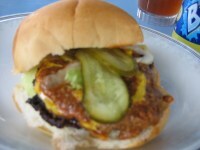 The single patty on the burger was a bit small, and lost in the bun and toppings but the taste and texture was good. We finished off our lunch with the ususal chatter until one member decided to thumbprint his evaluation sheet with gravy. Others followed suit using various media, ahh good times. The burgers are great, but so is the company! The lunch time banter can get quite hilarious and often results in laughter-tears or someone spraying Pepsi across the table (and it wasn’t the 5 year old in the picture). This week a friend to several of us had a baby while we were having lunch. How do we know? Moments after the big event, but before the newborn could even get his first wipe down; she posted a picture of proud mother and her newborn on Facebook. I said “Remind me not to borrow her smart phone.” The diner beside me, we’ll call her Tannis, blurted “Why not? You don’t use your hands - you just sit there!”. It’s amazing the things you learn over lunch - congratulations Amie! 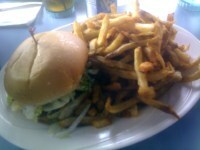 I could not finish the fries that came with the Fatboy - they give you a HUGE mound of them. I blame it on the milkshake. Note: the milkshake appears to be served in a glass wine carafe, as a fine shake should be. Been going to Original Georges for 10 years and can't believe you rated it 24th.I have tried most on your list in fact went to Sonyas yesterday for first time it was good food cheap price but took over half an hour for two cheese burgers it looked like a one man show.any ways it was worth a try but diffinetly no Georges I will stick with the best double cheese burger at O.G.extra fried onions no chili YUM!!!!!! I've been going to George's for the last 30 years and while the service usually left a lot to be desired the food usually made up for it. Not any more. While every restaurant seems to be raising prices to deal with inflation, George's has also cut his quality in half on top of that. Gone are the days of an honest burger and fries at this joint and we'll be taking them off our map for good. The food tonight was terrible, absolutely terrible and the service was even worse. The Fat Boy, and I use the term very loosely, was on a major diet. The fries were a soggy mess saturated in old, over-used cooking oil. The chilli on the fries was watered down and nothing more than some ground beef in runny tomato sauce. The girls were all miserable and could care less if we were happy or not. I highly recommend that you avoid this place at all costs and hopefully it will sink so that they can no longer ride the reputation they built years ago when George was actually hands on and wanting to earn your business. 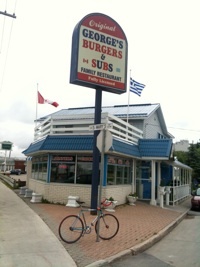 This is no longer George's Burgers and Subs, don't be fooled by the sign. Just went there for lunch today; 2 double fat boys and a large fries to go. Ate one fat boy and about 1/3 of the fries. Stuffed. As good as it ever was, and *still* dukes it out for top Winnipeg fat boy/fries. There are better fries to be had in our city, but you'd be hard pressed to find a better burger; hot and moist on the inside, crusty and loaded with toppings on the outside. Maybe the previous posters should go back to McDonalds, Wendy's or Burger King and leave the real food to real eaters.